A new £20m motorway service station building has opened to replace one which was badly damaged in a fire. The blaze broke out in a coffee machine at Fleet services on the southbound M3 late on 14 December 2016. No-one was injured but the rear of the building was destroyed. Shops and restaurants were later housed in a temporary structure, which was formerly used as a dining hall for Olympic athletes at the London 2012 Games. 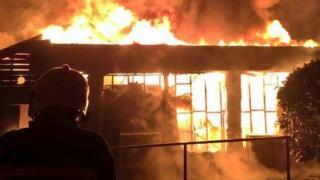 About 100 firefighters were involved in tackling the blaze and part of the motorway was closed before the fire was brought under control in the early hours. The footbridge which runs over Fleet services, named after BBC Radio 1's Scott Mills, was also closed due to smoke-logging. The new structure is supported by interior timbers imitating growing trees, operator Welcome Break said.